Many thanks to Michael Holford one of the partners from Lawrence Hannah for providing SSKC with support as a trophy and Medal sponsor for the SSKC IJKA Karate Championships scheduled for May 2010. Lawrence Hannah LLP is a firm of chartered surveyors, property and construction consultants, established in 1995, and are now one of the largest firms of its type in York. With an extensive client base, they provide a multi faceted approach to all aspects of commercial property and development projects. With extensive experience and skills Lawrence Hannah LLP are well equipped to provide a unique one stop service. Click on the yellow button below to return to the "HOME" page or to access Lawrence Hannah's website. Many thanks to Stephen Kelly from Gough & Kelly for providing SSKC with support as a trophy and Medal sponsor for the SSKC IJKA Karate Championships scheduled for May 2010. Founded in 1988, Gough & Kelly has established itself as a premier provider of security related products and services. From humble beginnings, the company has grown by staying true to its ethos of building excellent relationships with its clients. Providing tailored solutions for both the public and private sector including many large blue chip companies including BOC Gases and Nestle. Click on the yellow button below to return to the "HOME" page or to access Gough & Kelly's website. Kato Shihan 9th Dan IJKA World Chief Instructor was at Selby for the whole weekend. Following the Saturday and Sunday sessions karateka took part in the IJKA Yorkshire gradings. Over 30 students graded and all achieved either a full grade or a temporary grade - Congratulations! Selby students achieved 10 Full grade passes and 7 Temporary grades. If you click on the member button in the sidebar you will see that all your grades have been updated. I would like to share with you a little information about karate Kyu gradings in the IJKA, which will hopefully help karateka and parents alike. There are Childrens (Pee Wee) grades 12th Kyu to 10th Kyu and Adult grades 9th Kyu to 1st Kyu. Each Kyu grade is a step towards you Black Belt. Karate is not a Sport, it is a martial art. The study of the art requires a maturity and originally there was only adult Kyu grades (9th to 1st). To enable younger children to take part the Pee Wee grades were developed for children who started Karate before they are 11 years old. After their first three grades a child will commence "Adult" grades, this could be at a relatively young age ( 8 or 9 years old). 9th and 8th Kyu are beginner grades where the examiner is looking for a basic understanding of stances, technique and kata. 7th Kyu (Yellow) to 4th Kyu (Purple/White) are the mid Kyu grades, significant improvement between grades is expected and the standard between each grade is very demanding. Each step in these mid grades is likely to take a student 24 to 30 training sessions (very rough guide). A child/youth is likely to take a little longer than a adult. If you only train once a week it is likely to take 6 months between full grades. 3rd to 1st Kyu grades, the Brown belts is another big step up. Most karateka who train regularly will take a lot more time between these grades. Youths / cadets and young adults tend to progress faster than older karateka. It is not uncommon for Students to be a brown belt for a considerable time and indeed not all Brown belts will have the determination to develop to a Black Belt. Each of the three elements are tested and the examiner is looking for evidence that you have reached the required standard to receive a full grade. They will note if your effort has fallen short of the "Full Adult" standard, if you have achieved the standard, or if you have excelled. Train regularly at your dojo - It is very difficult to achieve full gradings to Yellow belt and beyond if you are only training once a week. If you can't train twice a week at the dojo, you should be practicing at home. If you were learning a musical instrument you would practice....karate is no different. Look confident. It is easy to look confident if you are confident so follow my first tip. Spirit. You must show an appropriate level of martial spirit.Whether it is a Kia!, or the execution of a technique. Effort. You must demonstrate 100% effort during your grading. We are all different ages, shapes and sizes, we will not all be able to perform the same technique / kata in the same way but we can all give 100% effort. Mistakes. They don't matter, if you have taken on board all of the above. The examiner will ask you to try again. If you have poor technique and no effort, this is not mistake and you will probably not be asked to try again. 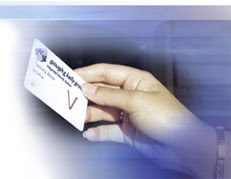 A full grade Pass = You have achieved the required standard and will progress to the next level. A half grade Pass = You have fallen a little short of the required standard in usually two or all of the elements. You will progress to the next level and will be able to wear the appropriate belt. At the next grading you will be re-tested on your current temp grade as well as the next grade. Fail = You have fallen short of the required standard probably more than once on two or three of the elements. You have not achieved the standard to progress on this occasion. It looks like Sensei Nick was well and truely on the receiving end of Asai Ryu karate. Osu! 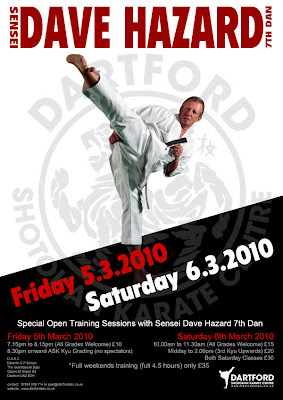 Rebecca and I will be travelling to Dartford to train with Hazard Sensei before popping over to Dr Johnathan's on the Sunday to train with Kato Sensei on the Sunday. Another great weekend! Details of all events can be found by clicking on the diary button in the sidebar. 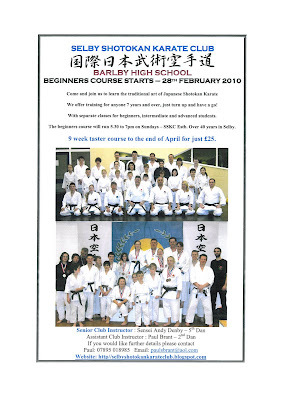 28th February will be week 1 of a 9 week taster course of Shotokan Karate at Barlby High School. We offer training to anyone 7 years and over, just turn up and have a go! The course will run from 5.30 to 7.00 pm every Sunday until the end of April. For current members it is an ideal opportunity to bring a friend down. Paul will be running two four week courses for St Johns Ambulance cadets between April and July this year to cover their self protection module. Paul trained in Jiu-Jitsu for many years and attend Shodan before getting too involved with Selby Karate Club. The courses will cover situation awareness, keeping yourself safe and basic protection drills. The SSKC will be running these courses at a discounted rate for the St Johns and the monies that are raised will be added to the SSKC Fund for the development of our karateka. Many thanks to David Leadbeater who has arranged what will be our first fundraising event of 2010. David has planned a Circus day at Hambleton school where we train on a Wednesday. The school has agreed to give SSKC a number of weeks free hire in exchange for David's services. The "In lieu" amount will appear in our fundraising table on the "Sponsors and Fundraising" page. 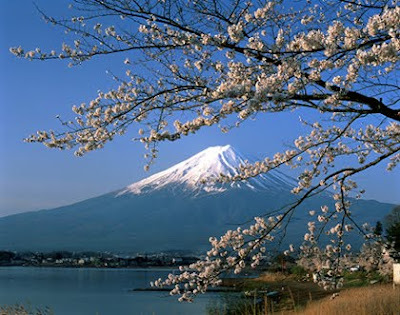 The IJKA are in the early stages of planning a trip to Japan in August 2011. I know it is eighteen months away, but it is worth considering sooner rather than later. No details are known at the moment, but I would expect costs to be in the region of £2,500 per head, for the whole trip. It is a life long ambition of many karateka to train at some stage along "the way" in Japan and these opportunities do not come along often. It is normal to fund a trip by a mix of sponsorship and personal contribution. If any SSKC member is interested in training in Japan in August 2011 can you let me know soonest? My feeling is that as a club we would need to consider our fundraising opportunities over the next 18 months. If we wait until the details are firmed up in 2011 it would leave little time to fund raise or save a significant personal contribution. Many thanks to Andrew Rees from Grimsby Resin floors for providing SSKC with sponsorship to facilitate our club hosting Kato Shihan over the weekend 20/21st February 2010. 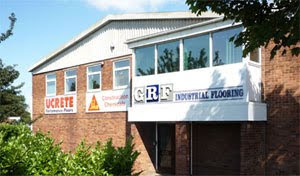 GRF provide Industrial flooring solutions throughout the UK, specialising in the food industry. This is the second time GRF have provided sponsorship, the last time would have been in about 2004. Click on the yellow button below to return to the "HOME" page or to access GRF's website. Shaun from the TSW has recently interviewed Yutaka Koike Sensei - JKS, it is well worth a read. I will never forget the session with Koike Sensei at Campbell Sensei dojo in Nottingham - Brilliant. Sensei has a unique teaching style and is renown for his bunkai, I will never forget his great beaming smile as Murphy Sensei hit him full speed and power again and again, no blocking just absorption and breathing. Unfortunately Josh couldn't make it this weekend so it was left to Gullen Shihan, Mike from York and myself to represent IJKA Yorkshire at Kato Shihan Whitchurch course this weekend. For one reason or another numbers were well down and there was nowhere to hide in the dojo. The lack of karateka meant that those of us that managed to make it were getting very personalised tuition, brilliant. There was a strong focus on short quick kihon, designed to develop speed and reaction for kumite. This was the main focus for the weekend training, but Sensei still managed to get a fair amount of kata into the sessions as well. On the Saturday we trained in Heian Shodan, Tekki Shodan, Junro Shodan and Kibaken Shodan. In Heian Shodan Sensei explained how with slight alteration within the transition of a movement more power could be developed, there is much for me to do with personal practice here. The work on Tekki Shodan was really useful, Sensei corrected some of the errors in my technique. This is great because the club has a number of karateka currently learning Tekki Shodan. Next was Junro Shodan, I have been training in the first three Junro kata with Gude Sensei at Haxby over the last 4 or 5 weeks. So It was handy to confirm a few of the finner detail. Lastly on Saturday we practiced Kibaken Shodan, this is not a kata I have seen before and to honest I was struggling. First thing Sunday Gullen Shihan was running through parts of Empi with me and then he went onto Kanku Sho as a warm up. Kato Shihan taught the Meikyo series, Shodan the standard Shotokan kata, Nidan (Asai ryu) and Sandan (Kato Ryu) . Shihan also taught Matsumura Rohai and concluded with Kibaken Yondan. Again I found the Kibaken kata not that easy to pick up and will need to train in it a few more times. Sensei did some great bunkai to Meikyo and it was a great refresher it has been a while since I have practiced it. Meikyo Nidan is one of my favourite Asai Ryu kata and this time round I picked up even more detail that I was not aware of. Meiko Sandan, I need to go away and learn properly. Luckily Sensei Simon from Haxby was down tonight and was asking a couple of questions on M3, I might not be able to remember the kata but I managed to remember all the moves that he wanted to check with me. Hopefully I can practice the kata with Simon over the next 2 weeks, in case Sensei teaches it while he is with us on the York Course at Barlby on the 20/21st February. Sensei also gave me three Dan grade certificates, Helen and my Nidan and Dom's Shodan. Helen I hope you will be able to collect yours soon. In a couple of hours I will be heading for Whitchurch with Josh for another weekends training at the IJKA hombu dojo. As always never sure what the weekend will bring...we will have to wait and see. Last time Josh attended he was introduced to ten katas that he had never seen before, hopefully we are not in for a repeat session? I have only just realised that this is the 400th post on my main blog and what could be better than reviewing Heian Shodan. Above is a recent video from you tube on the "Nakayama Legacy" there is over 10 minutes of Heian Shodan, viewed from different angles, Bunkai, team kata and Nakayama Shihan teaching application - brilliant, Musokan1 many thanks for sharing, Osu! I have added it to my other Heian Shodan videos, please follow the links below to my Home page or my video pages.